Up to 80% of women will have uterine fibroids by the time they reach the age of 50. If you experience symptoms like abnormally heavy and painful periods, make an appointment with Marcela McDonald, MD, FACOG and Christine Richards, MD, FACOG at Capital Women's Care Howard County located in Fulton, MD. They offer comprehensive diagnostics and treatments to relieve your symptoms and heal your body. Call or schedule an appointment online today. Fibroids are benign -- noncancerous -- growths that develop in or on your uterine walls. You might develop just one fibroid or several. Fibroids range from the size of a pea to that of a grapefruit, or even bigger in rare circumstances. Fibroids are typically triggered by abnormal estrogen or progesterone levels. These hormones contribute to the regeneration of your uterine lining and are found in surgically removed fibroids. If you have a family history of fibroids or if you’re overweight, your risk of developing fibroids increases. In many cases, you might not have any symptoms at all, because often fibroids are benign and small. In these cases, you don’t even need medical treatment. 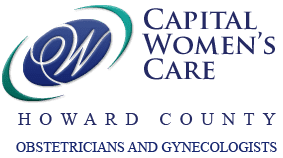 The doctors at Capital Women’s Care combine pelvic exams and diagnostic imaging tools like ultrasounds and hysteroscopy to diagnose fibroids. Ultrasounds send high-frequency waves through your abdomen that bounce back from your internal organs and tissue at different speeds, creating images on a computer screen. Your doctor uses these images to see if fibroids are present. Ultrasounds are either delivered externally through your abdomen or through a transvaginal wand so the sound waves have less tissue to travel through to reach your uterus. In some cases, if ultrasounds aren’t conclusive, your doctor may use hysteroscopy, a minimally invasive procedure, to look inside your uterus using a specially designed medical device. Your Capital Women’s Care doctor offers treatments to both relieve your symptoms and resolve your fibroids. In many cases, hormone-regulating medication helps to shrink your fibroids and reduce your symptoms. They may also suggest birth control pills and over-the-counter pain medication to reduce cramping and heavy bleeding. If your fibroids are large or if you have multiple growths, your doctor may suggest a minimally invasive procedure like a laparoscopic myomectomy or endometrial ablation to remove your fibroids. In very severe cases, they may suggest a hysterectomy. If you have pain or discomfort that suggests fibroids, call Capital Women’s Care or book an appointment online today.